I was fascinated by Gerry Taylor’s Boomers and Millennials research in late 2011 and heard him speak at the Orangebox presentation during Clerkenwell Design Week 2012. Inspired by his findings and my own interest and involvement in the growth of Smart Working and BYOD (Bring Your Own Devices) projects, I have been thinking a lot about the inevitable changes that these three initiatives will bring about and the operational relationships between them. Millennials (generally accepted to be those born between about 1980 and 2000) already have very different values from the Boomers (or Baby Boomers) born between 1946 and 1964. This will inevitably impact workplace practices and, as a result, workplace design. Before 2000, there was enormous concern about the “Millennium Bug”. This possible glitch in computer date calculations turned out to be a complete non-event and we can now see that the focus should have been on the population that has come of age since that date because its impact on the workplace will be monumental. Most significant are their values, aspirations and expectations. Many have been brought up with very supportive parents in an education system that avoided differentiation between winners and losers or any form of competitive sport. As a result, they believe they are invincible! The management challenge here is obviously to channel that energy without crushing their dreams! Offering them flexibility about when, where and how they work is potentially one element of this nurturing style of management and mentoring. Management by objectives and outputs rather than by inputs is another. These are key factors in a good Smart Working programme. More ideas about managing Millennials can be found here. Another obvious trait of Millennials is that they are “always connected”. They thrive on social media and may seem surgically attached to their smartphone. But the word “smartphone” now seems almost a misnomer since its use for telephone calls seems to be diminishing. After emailing, texting, poking, pinging, tweeting or BBMing, phoning is more or less the last resort! This means that communications styles will change and evolve, probably faster than they have ever done before. Organisations who provide email management or brand voice training to protect corporate culture and values will need to consider a much broader set of media. There are many statistics about the rapid growth in internet access from mobile devices but one that points most readily to Millennial users is that 50% of all online sales for Mother Day 2012 came from mobile devices. As their personal and work activities merge, these users will obviously be pressing for BYOD to optimise their user experience, regardless of time, location or circumstances! This flexibility of IT and communications devices and methods of work will suit the collaborative style of Millennials and their workplaces will need to reflect it. Perhaps they will redefine our expectations of Smart Working. Perhaps they will bring about the invention of totally new environments and concepts. These are exciting times! This short piece touches on only tiny segments of an enormous, evolving canvas – which dissolves and reappears before your eyes. What are your experiences? Are you a Millennial or do you manage Millennials? Tell me what you think. There is growing demand for employers to offer their people greater flexibility and choice in their use of technology. A comparatively new option is that the user chooses their own technology and brings it from home. Organisations may find this starts with their CEO asking to access corporate email on his/her iPad but the potential for this to escalate is substantial and inevitable. “BYOD” is here to stay! This is partly because, for the first time in history, domestic and personal technology at least matches and very often exceeds the specifications of products used at work. How many corporate employees have a Blackberry for work but prefer their personal iPhone? Similarly, how many iPhone or iPad users have also purchased a MacBook for use at home (or for their children) and, as a result, become disenchanted with their Windows PC at work? There is no doubt that Apple has been largely responsible for much of the impetus but the situation is more complex. Here are some other important factors. 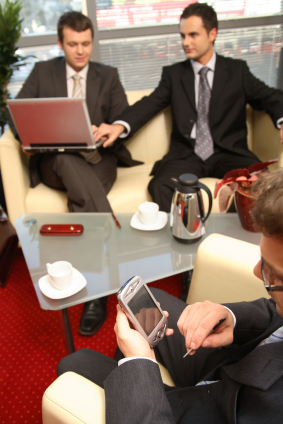 BYOD addresses a key factor in the growth of Smart Working. People most commonly think about the “where” and “when” of Smart Working but BYOD directly addresses “how” people work. Giving personnel increased technological flexibility adds to their comfort, engagement, motivation and acceptance of changing work practices. The growing influence of Millennials in the workplace brings new expectations and demands. This group grew up with Facebook: Millennials take an “always on” culture for granted. They are, by nature, incessant technology users and will be at their most productive with devices and applications they use personally as well as for work. Organisations who already have BYOD programmes in place confirm the increased productivity and motivation but have also noticed significant reductions in devices lost. Commercial pressure on employers may cause them to view BYOD as providing potential cost savings (although this will probably prove to be untrue). Increased use of cloud data storage and SaaS (Software as a Service) actually makes it easier to deploy a BYOD programme within many organisations. The biggest obstacle to BYOD is the issue of security. It has been described as the greatest challenge to corporate security “since Windows computers were connected to the internet”. To address this, many technologies and systems are available and a broad range of specialist suppliers and consultants has emerged to meet the need. The PC Pro magazine article (August 2012) by Tim Anderson provides good advice for those considering a BYOD project. Less debated but also very significant is the matter of ergonomics. This is even more important when BYOD coexists with a Smart Working programme. If your personnel elect to use a non-standard mix of computers and mobile devices, it may no longer be possible to provide standardised equipment (e.g. docking stations for laptops), even in the office. Using tablets for long periods can also create all sorts of postural problems. It is essential to create a systematic approach to these challenges. Where appropriate, a mobile worker option list can be integrated into an equipment shortlist for home workers and/or the risk assessment programme. Finally, embracing BYOD also needs culture change within corporate IT departments. Historically, they have dictated and enforced technology policy. Now they must be responsive to changing demands or, if possible, stay ahead of the demand. Here is a further parallel with Smart Working in the need to change management style. The management of Smart Workers requires a move to measuring work outcomes rather than inputs and, in a similar way, BYOD requires a move from the prescriptive IT management approach to a much more dynamic and responsive model. 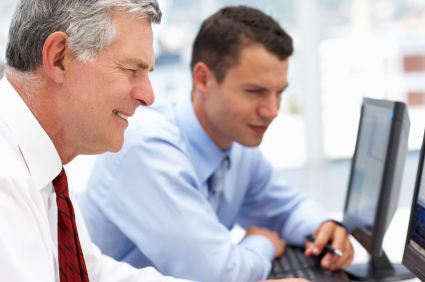 Are you already involved in a BYOD roll-out? Or thinking about it? We would love to hear your thoughts and experiences. You are currently browsing the Guy Osmond blog archives for June, 2012.